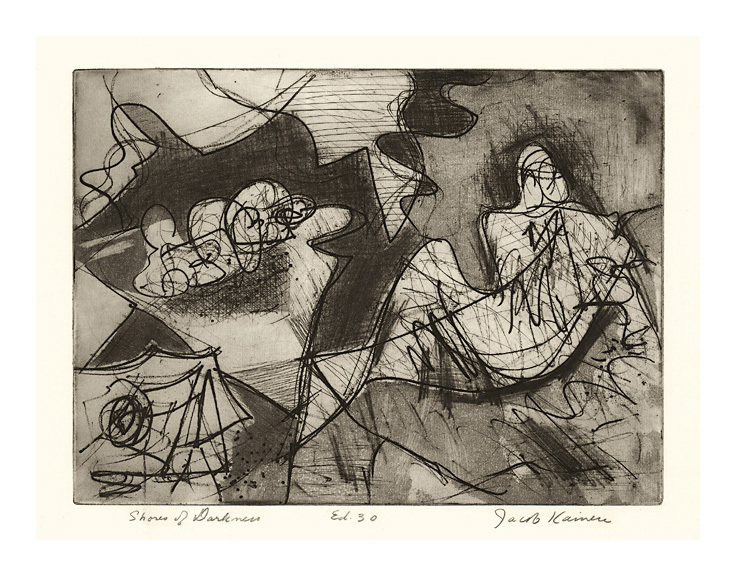 Shores of Darkness -- 1950, Etching, Soft-Ground and Aquatint. Flint 78. Edition 30. Signed, titled and annotated Ed. 30 in pencil. 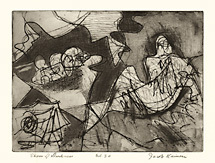 Image size 9 x 12 inches (229 x 305 mm); sheet size 12 1/4 x 16 1/4 inches (311 x 413 mm). A superb, richly inked impression, on cream wove paper, with full margins (1 1/2 to 2 3/8 inches). Barely visible mat line, otherwise in excellent condition. Printed by the artist. From the estate of Milton Goldstein.